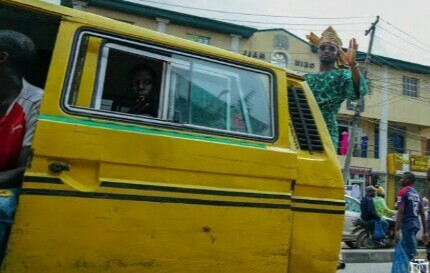 Nigerian social media sensation, Oluwatobi Adeshina Onibatedo popularly known as Mama Tobi took his craze to Lagos streets flirting with the famous Lagos Yellow buses known as Danfo. 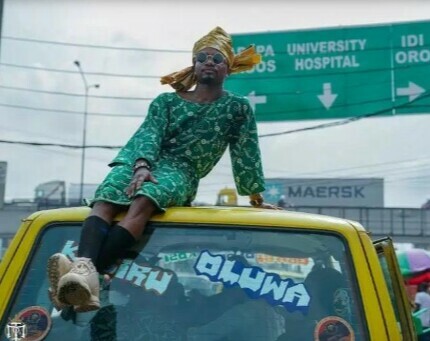 The US-based comedian who returned briefly to Nigeria had a photoshoot on a busy street in the heart of Lagos Island. Shot by Temple Motion Pictures, the hilarious photos show him striking his famous poses on the roof a Danfo boss. Mama Tobi was the muse for many Nigerian soccer fans when the team where booted out of the Russia World Cup. A hilarious photo of the comedian lying flat on the floor hapless emerged as one of the most shared memes again reinforcing his popularity among fans.